According to Ed Sniffen, the Hawaii DOT's deputy director, the state needs about $7.5 million for every mile of highway that must be raised, pushed back or relocated to prevent damages from erosion and flooding over the next 50 to 100 years. 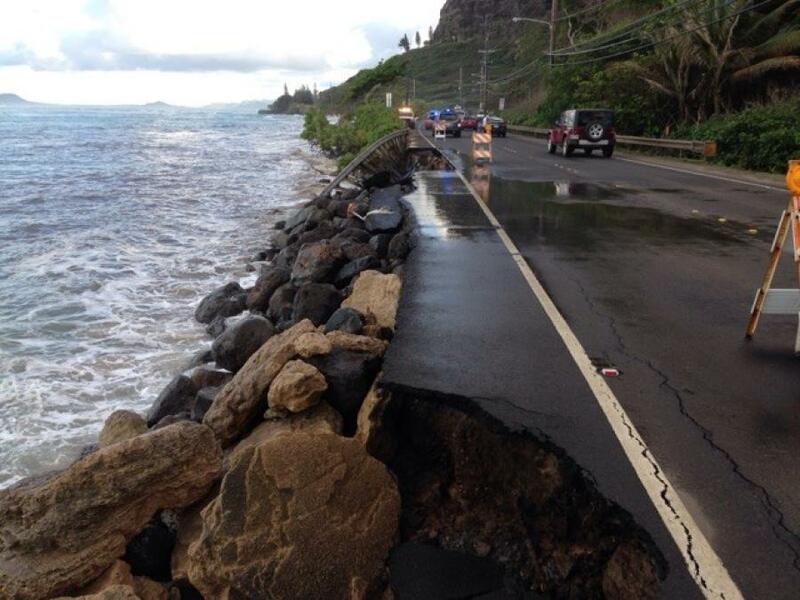 As sea levels rise in Hawaii, the beaches—and roads—are taking a hit. In 2016, the waters on Oahu's Windward Coast ripped off two big pieces of the Kamehameha Highway. Crews performed repairs, and while Hawaii's transportation officials said the repairs would help to deter future erosion, they said the fix wasn't permanent, the Honolulu Civil Beat reported. Now, the state's DOT is facing the hefty cost of protecting its highways from the ocean. According to Ed Sniffen, the Hawaii DOT's deputy director, the state needs about $7.5 million for every mile of highway that must be raised, pushed back or relocated to prevent damages from erosion and flooding over the next 50 to 100 years. Add to that $40 million for every mile of affected bridge, and the state DOT is looking at a baseline cost of $15 billion, the Honolulu Civil Beat reported. Sniffen said that 15 percent of all state roads are at risk, including key commuter routes, and that choosing to take on the expense of repositioning would save the state from having to build completely new roads in the future. “It's something that's coming, so we've got to address it,” Sniffen said. Lately, Hawaii DOT has been performing quick, temporary fixes on damaged roadways, but it no longer builds walls in these areas to prevent erosion because that equates to “millions of dollars that we're putting in an area that we're not going to be in very soon,” said Sniffen. The Hawaii DOT and researchers from the University of Hawaii are currently looking into the effects of climate change resulting from human activity on the state's highways. A plan outlining action steps will be released in June 2019. Right now, the Hawaii Climate Change Mitigation and Adaptation Commission reported that it expects Hawaii to see sea levels rise by three feet, but that number could increase, the Honolulu Civil Beat reported. There's no doubt that $15 billion is an enormous price tag, but the cost will be spread across several decades, the Honolulu Civil Beat reported. According to Rep. Sylvia Luke, chairwoman of the House Finance Committee, Hawaii spends around $1.5 billion in capital projects in its two-year budget cycle alone, so the cost could be absorbed across a span of time. However, doing so may push back the state's spending on other necessary infrastructure projects, Luke said.